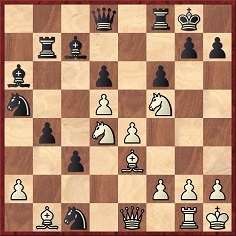 26 Ne6 Qe8 27 Bxc1 Rf7 28 g4 Qa4 29 g5 c2 30 gxf6 cxb1(Q) 31 Nh6+ Kh8 32 Nxf7+ ‘and mates next move’. 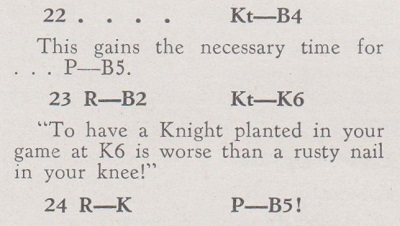 Source: City of London Chess Magazine, May 1874, pages 97-98. For the same attribution, see I.A. Horowitz’s books How to Win in the Chess Openings (New York, 1951), page 44, and How to Win at Chess (New York, 1968), page 50, but where did Steinitz make the comment? Exclamation marks do not enliven clichés. In each case Heisman provided a sort of source: respectively, ‘Chernev, The Bright Side of Chess, p. 111’ and ‘Chess, Jan. 8, 1955, p. 17’. Both those references were mentioned in C.N. 3514, but they lead nowhere. The latter was merely a sourceless answer to a Christmas quiz.